If the early dinosaurs had star parties, they probably weren’t impressed by Saturn. Based on data from the Cassini spacecraft’s last hurrah, planetary scientists strongly suspect that the iconic hula-hoop of icy particles encircling Saturn is a relatively new addition. Astronomers have made this suggestion before, but with various hesitations. What they really needed was a good grasp of how much stuff the rings contain, as well as how quickly they’re being darkened by infalling space debris. These bits of information would indicate how long the rings could survive in their current, icy-bright state. 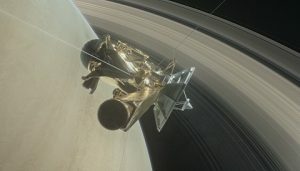 Cassini provided a unique opportunity to test the hypothesis. As the spacecraft’s gas gauge sank toward empty, mission planners rerouted the orbiter to take 22 daredevil dives between the planet and its rings. As it passed through, the spacecraft felt the gravitational tug of both the planet and the rings. Luciano Iess (Sapienza University of Rome) and colleagues undertook a complex analysis of these dives, teasing out the rings’ contribution from the planet’s. Reporting January 17th in the journal Science, the team concludes that the rings have a mass of 15 million trillion kilograms (1.5 x 1019 kg), roughly 40% that of Saturn’s mid-size moon Mimas or about a millionth of Earth’s mass. Other Cassini data also indicate that some 10 times more space dust is raining down on the rings than expected, meaning they can’t be excessively old and look as bright as they do. Combined with other measurements, the observations support an age for the rings of roughly 10 million to 100 million years, favoring the higher end of that range. Previous work suggests that the rings won’t last forever, either — maybe another couple hundred million years. The upper end of the age range echoes that previously suggested for several of Saturn’s mid-size icy moons. Some planetary scientists think these satellites formed from the rubble of a previous generation of moons, which smashed into one another and obliterated. How that event and the current ring system might be connected remains unclear, however: It’s hard to understand why the detritus that makes up the rings would have migrated so close to the planet instead of clumping together into additional moons farther out, the team notes in the paper. One alternate idea is that Saturn caught a passing comet or icy asteroid and tore it apart, then festooned itself in the wreckage.